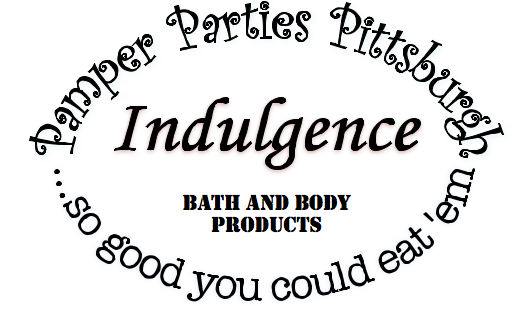 Indulgence Bath and Body Products are made from only the most decadent all natural, edible ingredients, so when we say they're "so good you could eat 'em" we mean it! 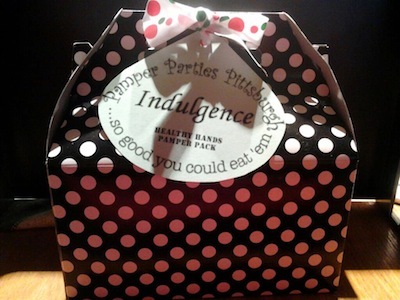 Scroll down to the "Pamper Packs" Section to see some Indulgence Gift Ideas! When I worked in a spa, clients were always asking about product ingredients, and I couldn't always answer them. I wanted to be able to confidently and truthfully answer clients questions about the ingredients and effectiveness of the products I was using in my own business, so I decided to do some research into the benefits of all natural skincare, and formulated a line of bath salts, sugar scrubs and lotions to be used in my manicure & pedicure services using ingredients that I could purchase at the grocery store. When the response to the products was so positive, I made the products available for use at home. 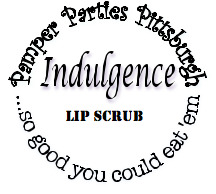 From there came bath bombs, bubble bath, and skin care products, which led to the addition of facial services to the Pamper Party Menu. Indulgence products are not part of a National Chain. I am not a representative of a larger company. I am a professional esthetician who has education and experience in skincare. There is no Manufacturer, no Middleman, and no Mark-ups (and no chemical preservatives or fillers either). I have researched, formulated and tested every product myself. 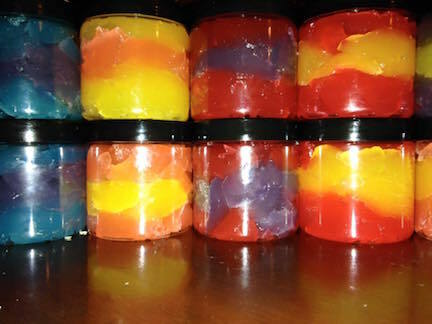 They are mixed, jarred and labeled in my home, and contain no chemicals or mystery ingredients. Just open up your product's tag and look at the Ingredients list, you will see things like: sugar, vegetable oil, cinnamon, cocoa powder, essential oils, baking soda, cornstarch, citric acid, shea butter, coconut oil, and honey (to name a few). I carefully and faithfully stick to edible ingredients, so if your child or pet get into your products, they will not harm them, and I plainly list the ingredients in "layman's terms" so that you don't have to be a scientist to understand what you are using. Indulgence Products are and always will be unique, effective, and affordable. *Please see the Photo Gallery for more detailed descriptions of all the Indulgence Products including uses, ingredients, and explanations of their effectiveness. Indulgence Body Scrubs combine sugar, oil, honey and various other natural ingredients to exfoliate and moisturize even the driest skin. Your skin will never feel softer, silkier, or smoother than when you use Indulgence Body Scrubs in the scents of some of your favorite treats! 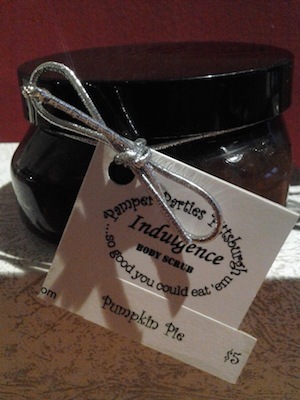 Indulgence Body Scrubs are safe enough to use anywhere on your body and gentle enough to use everyday. Order your Scrubs NOW, just type the quantity that you would like in the box below your scent and size of choice. Be sure to fill out the contact info section, and then click submit! If you are interested in creating a custom scent, please describe what you would like below, and I will let you know if it is possible. This Wiggly Jiggly refreshing jelly soap is the FUN way to Wash. Perfect on a hot summer day, or as a fun way to get kids into the tub. Did you know that Scandinavian Spas and Hydrotherapy Practices use combined hot & cold stimuli to promote circulation, muscle tone, and skin texture? Pop Shower Shimmy in the fridge for added health benefits, or use it at room temperature. It's not quite soap, not quite shower gel... this is great for traveling, because it won't leak! Order your Shower Shimmy NOW, just type the quantity that you would like in the box next to your scent of choice and appropriate quantity discounts will be automatically applied. Be sure to fill out the contact info section, and then click submit! Squish it, Mold it, Lather it! 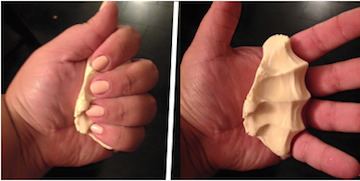 Silly soap is a moldable putty soap. Just pinch off a little bit, play with it (required), then lather it up and wash. Organic Castile Soap gives you a safe thorough clean, cornstarch helps to give it it's unique texture, and Coconut Oil will help to moisturize your skin. Silly Soap can also be used as bubble bath, just run it under warm water to make bubbles. Silly Soap is great for kids! Forget the tub toys, Silly Soap will provide hours of bath-time fun. It's also great or traveling, because it won't leak! Order your Silly Soap NOW, just type the quantity that you would like in the box next to your scent of choice and appropriate quantity discounts will be automatically applied. Be sure to fill out the contact info section, and then click submit! Order your Bubble Bath Cupcakes NOW, just type the quantity that you would like in the box next to your scent of choice and appropriate quantity discounts will be automatically applied. Be sure to fill out the contact info section, and then click submit! 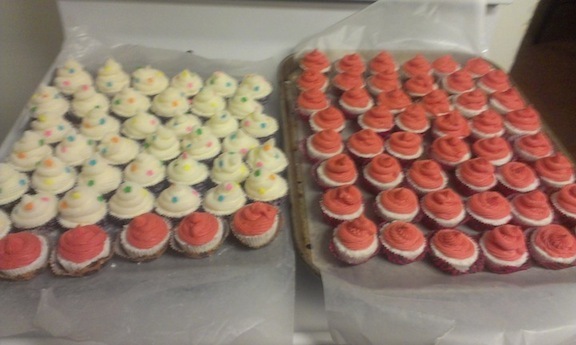 *Mini Bubble Bath Cupcakes take up to 2 weeks to make, due to a multi-step process that requires several days drying time. If the scent you order in not currently in stock, you will be given the choice of waiting for your preferred scent to be made or choosing a scent that is in stock. It's like a makeover for your Mini Bubble Bath Cupcake... A larger Bath Bomb in the shape of a cookie is topped with fluffy bubble bath "icing". These cookies also combine the skin and relation benefits of baking soda, epsom salts, cornstarch, and citric acid with the fun of a tub full of bubbles, but gives you enough product to use for multiple baths. Order your Bubble Bath Cookies NOW, just type the quantity that you would like in the box next to your scent of choice, and quantity discounts will be automatically applied. Be sure to fill out the contact info section, and then click submit! 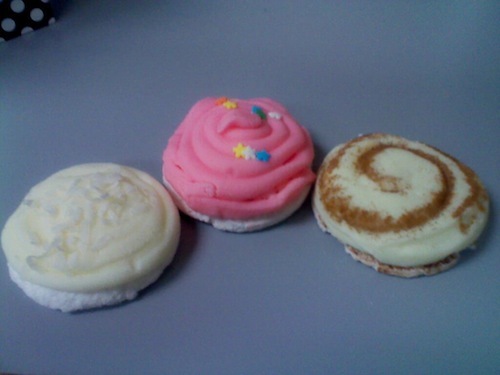 *Bubble Bath Cookies take up to 2 weeks to make, due to a multi-step process that requires several days drying time. If the scent you order in not currently in stock, you will be given the choice of waiting for your preferred scent to be made or choosing a scent that is in stock. 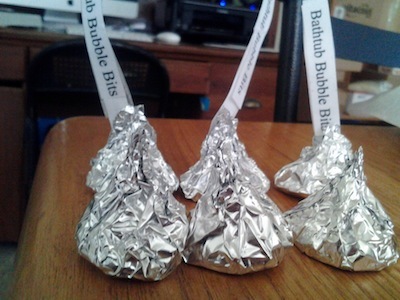 Run these little bits under hot water to create a sweet smelling Bubble Bath! Dessert for you skin! 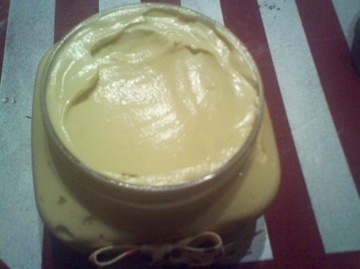 This all natural Shea Butter Moisturizer is infused with nourishing Coconut Oil, and whipped into a light buttery balm. Perfect for extra dry skin on heels and elbows, dehydrated skin from forced air heating/sunbathing, or just as a daily moisturizer! Order your Body Frosting NOW, just type the quantity that you would like in the box below your scent and size of choice. Be sure to fill out the contact info section, and then click submit! Emollient Beeswax and Shea Butter combine with Castor Oil (ask your grandma, this stuff is awesome), honey, and pure cooking extracts to give you a powerfully hydrating tasty lip balm with plenty of glossy shine. Smooth Lip Butter on by itself or wear it over your favorite lipstick to nourish and moisturize your lips. Order your Lip Butter NOW by entering the quantity you would like next to the flavors below and clicking the "submit" button at the bottom of the page. Don't Forget to complete the contact info section! I've taken the Lip Butter Recipe and added ingredients which will exfoliate and increase blood flow to lips, giving you a lip scrub with all the nourishing and moisturizing benefits of a beeswax, shea butter, and castor oil AND an added plumping smoothing punch! Rub this scrub on dry lips for an instantly smooth, soft, kissable pout! 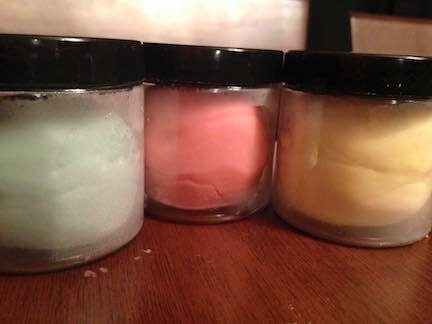 Order your Lip Scrub NOW by entering the quantity next to the flavor you would like and click "submit"
Perfect for the girl-on-the-go who doesn't have time for 3+ steps in the morning. Corn meal gently exfoliates using round particles (no rough edges to scratch or scar delicate facial skin) while lemon juice deeply cleanses skin, removing oil and killing bacteria. Honey hydrates and prevents the growth of bacteria and a touch of Vegetable Glycerin naturally moisturizes skin, and provides slip for exfoliation without the addition of oil. *If your skin is very oily, you should not need a moisturizer. ***Mask weekly or bi-weekly with Aloe Vera Moisture Mask or Cocoa Oat Detox Mask to complete the Indulgence Skin Care Regimen. Order your One-Step-Facial NOW, just type the quantity that you would like in the box below your size of choice. Be sure to fill out the contact info section, and then click submit! Soothing Aloe and Moisturizing Coconut Oil come together in this facial mask to deeply hydrate and condition skin. Aloe increases cell renewal, promotes collagen production, and even plumps fine lines and wrinkles while coconut oil penetrates and re-conditions even the driest skin. A touch of honey helps to prevent the growth of bacteria, and a hint of honeysuckle provides aroma therapy... Who needs a $75 facial at the spa anyway? Order your Aloe Vera Moisture Mask NOW, just type the quantity that you would like in the box below your size of choice. Be sure to fill out the contact info section, and then click submit! Cocoa, Oatmeal, Milk Powder and Bentonite Clay come together to give you a powerful detoxifying mask for you face or body. Oatmeal soothes skin while gently absorbing excess oil. Bentonite Clay draws dirt and impurities from deep within pores. Cocoa and Milk Powder work together to nourish skin and restore it's natural moisture. You will not find another mask like this anywhere, as it contains all these beneficial ingredients without any preservatives or chemicals. This mask comes in powdered form and is mixed at home in small batches with water to bring you a fresh bacteria free product each and every time you use it. These ingredients, when moistened would have no shelf life without mixing in chemical preservatives. This mask can also be mixed with milk (for extra moisture), wine (strong antioxidant properties), or champagne (very astringent): Just mix 1 teaspoon powder with 3 Tablespoons of your chosen liquid for a mask or 6 Tablespoons for a thinner cleanser, heat, stir, and apply. You can also add things like: pureed fresh fruit for exfoliation (lemon, pineapple), moisturization (banana, avocado), or skin tightening (strawberry) effects, eggs for a cell renewal boost, or Aloe to plump fine lines and wrinkles. This mask is great for oily or acne prone skin, but can really be customized for any skin-type. Order your Cocoa-Oat Detox Mask NOW, just type the quantity that you would like in the box below your size of choice. Be sure to fill out the contact info section, and then click submit! This is not your average moisturizer! An antioxidant rich mixture of raw aloe vera gel and green tea is infused with vegetable glycerine to provide you with a rich oil-free moisturizing serum that will not only hydrate but nourish your skin while plumping fine lines and wrinkles. Anti-bacterial honey helps protect skin from blemishes while Vitamin E promotes the production of collagen and elastin. This unique serum contains NO oil or wax, so it will not clog pores or feel heavy on your skin. It will not leave skin feeling greasy or sticky, but provide a silky foundation for even application of make-up. This is a skin-care must-have, whether using it in conjunction with the Once-Step -Facial and Aloe Vera Moisture or Cocoa-Oat Detox Mask(recommended), with another cleanser, or on it's own. *A&GT Serum doubles as a make-up setting spray. The glycerin in this product will keep your makeup in place all day! **A&GT Serum is also great for sunburn, rashes (like eczema or rosacea), and minor cuts and scrapes. Just spray affected area lightly with serum for soothing aloe relief, nourishing antioxidants from the green tea will promote healing and cell renewal, and honey will add an antibacterial punch! Order your Aloe & Green Tea Moisturizing Serum NOW, just type the quantity that you would like in the box below your size of choice. Be sure to fill out the contact info section, and then click submit! 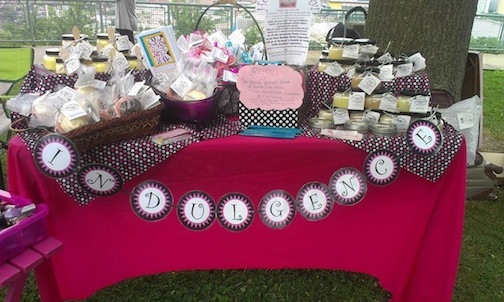 Consider Indulgence Products for your next events Party Favors. 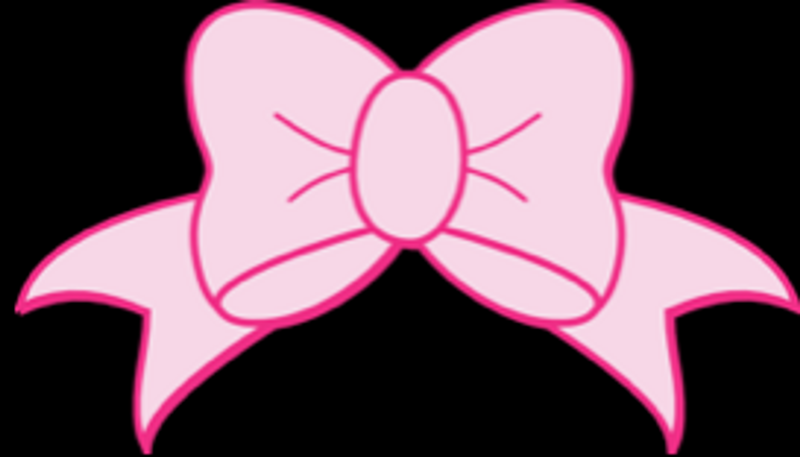 Choose any of the Products in the 20z favor size, and I'll add your choice of colored ribbons and a personalized tag! Give the Gift of Indulgence with these great gift options! Want to give a attractive thoughtful gift basket, but don't know where to start? Don't worry, I will do all the work, and you can take all the credit! 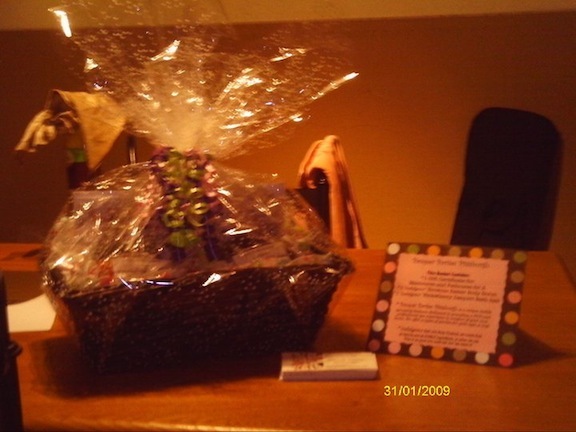 I will build you a custom gift basket for FREE when you order 5 or more Indulgence Products! Just provide me with the theme/color scheme and the amount you are looking to spend, and I will create a beautiful gift basket for you, ensuring that you get the absolute most for your money. Order your Pamper Packs NOW, just type the quantity that you would like in the box below your size of choice. 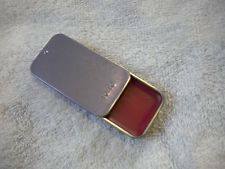 Then enter the scents you would like in the Comments box. Be sure to fill out the contact info section, and then click submit! 1 Body Scrub of your choice, 1 whipped body frosting of your choice, 1 rhinestone embellished razor, and 1 instruction card for achieving silky smooth legs in an adorable polka dot box with ribbons and gift tag. 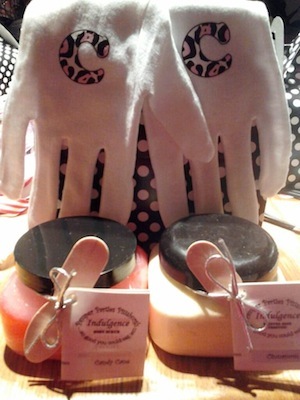 1 Body Scrub of your choice, 1 whipped body frosting of your choice, 1 pair of monogrammed cotton gloves, and 1 Instruction card for healing rough chapped winter hands, all in an adorable polka dot box with ribbons and gift tag. A sampling of all the Indulgence Bath Products... Perfect for any bath lover! Includes: Bubble Bath Cookies of your choice, Mini Bubble Bath Cupcakes of your choice, Bathtub Bubble Bits, and Sugar Scrubs of your choice all wrapped up in an adorable polka dot box with ribbons and gift tags. The One-Step-Facial, Aloe Vera Moisture Mask, and Aloe & Green Tea Moisture Serum, come together in this pamper pack to give the gift of beautiful skin. It also includes an informational card about the products, instructions for use, and an adorable polka dot gift box with ribbons and gift tags. Step 1: Deep Cleanse and Exfoliate in 1 easy step using One-Step-Facial. Remove with a warm wet towel. Step 2: Mask. Apply Aloe Vera Moisture Mask in a thick layer. Allow to sit on skin for 15 minutes. Remove with a warm wet towel. Step 3: Apply Aloe & Green Tea Moisturizing Serum to Moisturize Skin. Soak, Scrub, and Slather, thats the recipe for fabulous flip-flop ready feet all year-round! This pack includes your choice of 1 Mini Bubble Bath Cupcake of your choice (4oz pack) or 1 Bubble Bath Cookie of your choice (8oz pack), 1 Indulgence Body Scrub of your choice. AND 1 Whipped Body Frosting of your choice, plus instructions for giving yourself the perfect pedi anytime. All this is wrapped up in an adorable polka dot gift box with ribbons and a gift tag. Please complete this section before submitting your order! When you click submit, your order will come to my e-mail. When I receive your order I will contact you about shipping/delivery method, Total Cost, and Payment Method. Please add [email protected] to your address book in order to make sure you receive my reply. Thank You for Ordering Indulgence Products! If you would like to order party favors, please check the box below, complete the contact section, and click submit. I will contact you about your order. I do not live in the Pittsburgh Area, and understand that $5.00 will be added to my total for shipping costs.